Kraken Con is a new convention in the Bay Area. It was first held at the South San Francisco Conference Center near SFO. This convention is slightly different than most conventions as this one does not have a heavy emphasis on Anime or Western. Instead, the con seems to cater to both sides of the fandom. Celebrity Guests included Chris Sabat (Vegeta from DBZ), Jessica DiCicco (Adventure Time), Meagan Marie (CosBlog and Crystal Dynamics), and Martin Wong (Martin Wong Photography). There was also a strong indie presence there, including [cardboard], Yuumei (DeviantArt), and Carlyfornia (Fashion Designer). Overall, if you are not sure which fandom you are a part of, this is a good con for you as it takes the best of all worlds. Despite being a first year con, it manages to do just able everything right with the few resources they had. Starting with the registration line, the staff managed to quickly process both pre-registered attendees and the on-site attendees with very little wait time and a lot of organization. The staff were polite and were able to keep in contact with each other. The main exhibit hall was utilized effectively with clear sections for Artist Booths and Dealer’s Booths. There were also a photography booth and a small video game section in the far corners. Surrounding the Exhibit Hall were the Maid Cafe lounge, the Main Event Hall, and a smaller Panel Room. Space was clearly at a premium since the conference center usually caters to business meetings, but the organizers clearly knew how to partition the rooms and make the best use of space and seating. 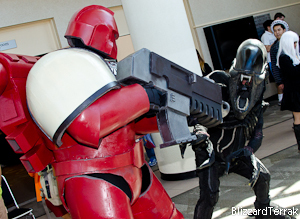 The con has some stiff competition from other similar sized conventions in Northern California so the decision to make it a generalist fan convention helped to make it unique. 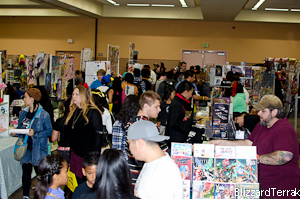 Many fan conventions have a general theme such as Comics and Western media, Anime and Japanese franchises, or specific shows like Star Trek and Doctor Who. Kraken Con chose to instead concentrate on the idea of creativity in media, which allowed them to cater to many fandoms. I like this since it avoids any kind of stigma of a Xenomorph from Aliens coming into contact with an Anime magical girl, changing an otherwise awkward situation into something fun and memorable. I love the feeling of inclusion this con encourages. Another thing to note is that having a con not based on the two most common themes: Western and Anime, is that it allows the showcase of other forms of fandom. 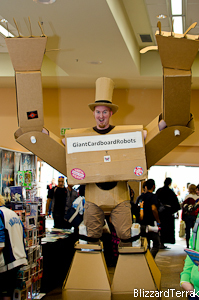 Webcomic creators, indie comic artists, and even a group showcasing some creative cardboard robot costumes were in force on the floor. If nothing else, there were enough things to do and see to keep anyone from being bored. Kraken Con had a very strong start, having almost double the expected attendees. No matter if you were a western media fan or a fan of Anime, both were welcomed. Having a strong indie presence helped to keep things interesting. There were cosplayers and industry guests from many different fandoms. And all these things were held together by a very competent staff. Keep an eye out for their next event in April 2014 because I’m sure these organizers will cook up another good fan-run convention. 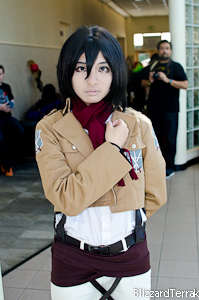 – Staff at con were nice and professional. – It’s…not an established convention? – First time location was somewhat out of the way. ~ by BlizzardTerrak on October 9, 2013.